Please join us for the Chenrezig Empowerment and Nyinge practice provided by Lama Thupten Nima. CHENREZIG (Tibetan) or Avalokiteshvara (in Sanskrit) is the Buddha of compassion (also know as Kuan Yin in the Chinese Buddhist tradition). NYINGNE is the purification practice of Chenrezig, powerful in healing illness and opening the heart of compassion. 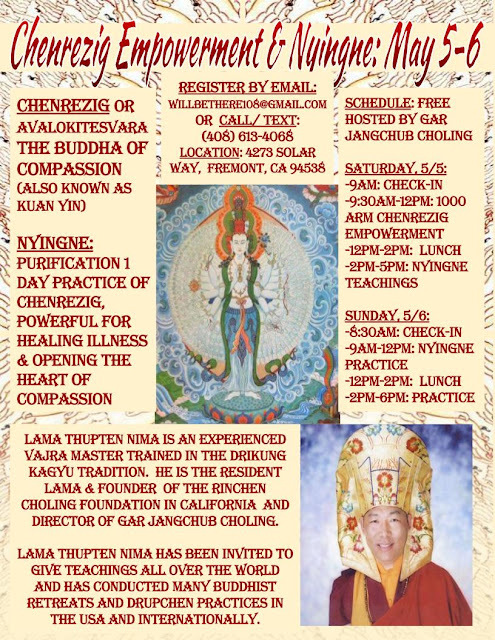 Schedule: All FREE sessions, hosted by Gar Jangchub Choling.